Before I move to the recipe of this very traditional UP dish I want to tell you a very funny incident, I was watching the TV show 'highway on my plate' hosted by Rocky n Mayur. I love this show not just for the yummy traditional food they showcase but for the friendly leg pulling both the hosts do with each other as well as with their hosts sometimes. In this particular episode they were visiting Reewa and were being hosted by some prince (belonging to the royal family of the state). Among the other traditional vegetarian dishes they were served this dish called 'Indrahar' ( meaning the food of Indra, the king of all the Hindu gods). 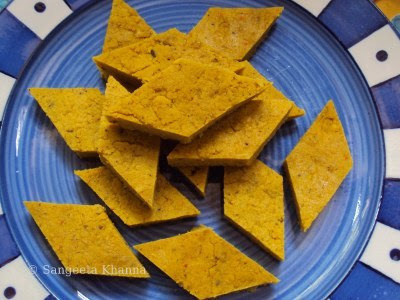 Indrahar was made with a mixture of all the lentils in a similar way this besan ki katli is made. The prince of Reewa estate described this dish in a very interesting way. He told that this is a very healthy meat substitute and the members of his family have been eating this for generations. In his own words...my grandfather, my father and myself have been eating this indrahaar, and see how strong we have been :) Telling all of this with his swollen chest to show the strength, I wonder how he was going on and on about the health and vigor of the male members of the family only. As if the ladies of the family did not need any healthy food, or as if healthy food was made for the male members only. The way he was telling and the way Rocky and Mayur were mimicking him was hilariously funny. But it frustrates me even today whenever I think of it. No, I am not a feminist that way but do get frustrated when there is a bias at this level. Now coming to the recipe of this healthy dish, as healthy as you can think of. If you make it with besan the texture of the katli will be very smooth, I like it a bit grainy so I use chana daal, soaked overnight and ground to paste. It is actually a lentil dumpling or lentil cake which can be very very versatile. It can be a fat free snack, a fried or shallow fried snack or can be curried in different types of gravies. 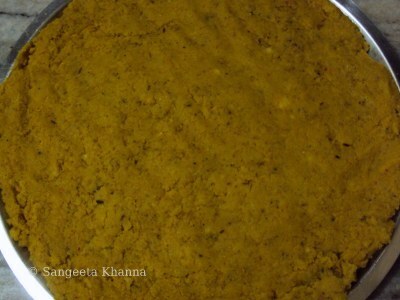 Grind everything together except oil into a paste, the consistency should be like a cake or idli batter so water can be added wile grinding for convenience. The mixture gets curdled first, and then within a couple of minutes of heating, it starts sticking to the kadai. Keep scraping and turning for about 5 minutes and you will see that it cooks to become a cohesive, sticky ball of dough. By this time a lovely cooked aroma indicates that it's done. This is a real healthy tea time snack . It is an eastern UP specialty and I have seen some bihari families making it too, a friend of mine told that it is called 'khadahara' in her family. The bengali version is called 'dhokar dalna', a bit different in taste and in appearance of the dumplings. I have posted a recipe of this besan katli in mustard gravy but it can be prepared with any kind of gravy which suits your taste. Thanks for sharing these gems...I've had a spinach version of this from a friend and funnily enough the roots are Bihar bordering Bengal! Nice recipe, looks tempting and delicious. Katlis look simply Yummy. Great Clicks as well. Thanks for sharing with us step by step photos for better understanding. Your blog is very interesting and a we are making a show named MASTERCHEF INDIA on the same line. Its a FOOD TALENT SHOW which will be on air soon on STAR PLUS. Besan ki katli luks very inviting...my mouth is full of water rightnow. 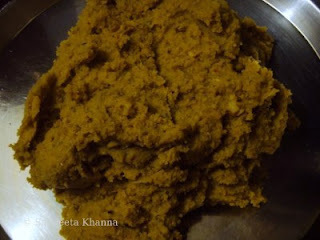 Hi thanks for ur lovely comment in my blog you too have a nice blog.the besan katli looks so yummy and tempting. Hi this is a new recipe for me. It looks like a sweet but is a savoury snack. I will give it a try soon. Thanks for visiting my blog. You asked me a question about the samosa pastry -but couldn't reply directly as I didn't have your email address. Yes, I use plain flour and then just warm water and lemon to make the dough. You can add salt to the dough if you like. This is a recipe I was taught by my dad who was a chef. You have a great blog too and I will be visiting again. 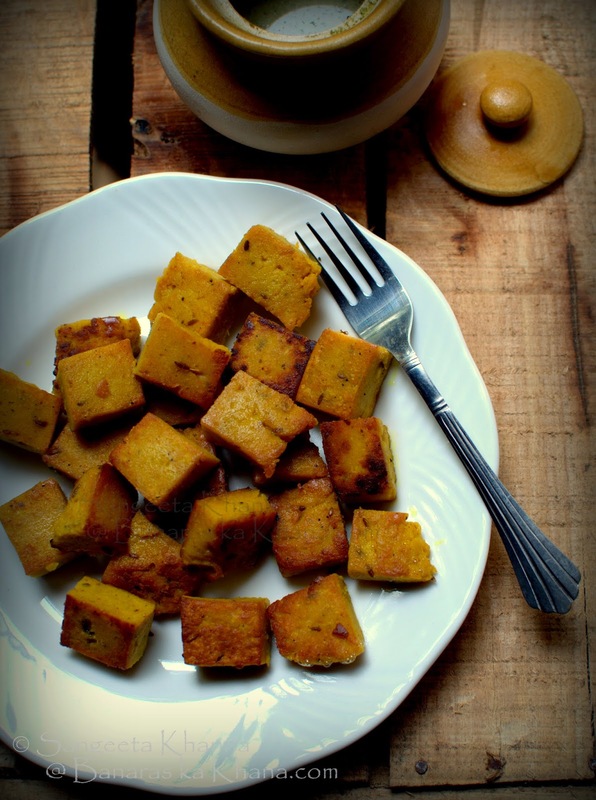 I came across your blog while looking for besan katli ki sabji. I am gluten free and I found many recipies in which you have not used wheat.Thanks for posting such good recipies. You are on my bookmark. Very nice to see this on blog. We are also making curry of these katli. Thank you Dear. 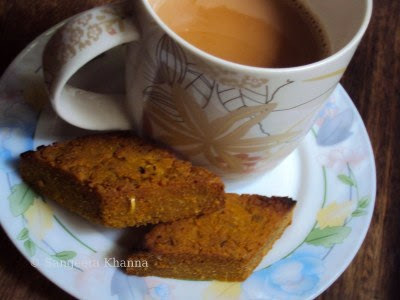 This is another recipe that has been in my 'must-make' list from your blog; the last I had was several years ago at my friend's home before she moved away. My hubby is from banaras and he would go crazy if I ll make these for him.. :) Wonderfully described , Well Done !